the Nuer and the Annuak. A stay of about 10 days will allow you to go round the Western region. From Addis Abeba to Nekemte, you will drive through a fertile plain surrounded by wooded hills. After Nekemte, a track snakes up between the high plateaus, leading to beautiful views over the whole area. Then you will reach Gambella, a nice little town that used to be the point of departure of the ships sailing toward Karthoum. You will be based in Gambella as you set out in search of the Nuer and Annuak people. Settled around Gog and the Tatta Lake, the Annuak people are sedentary farmers. 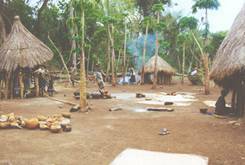 Their villages are scattered in the forest. Going from one village to another under immense trees, discovering their huts, their way of life, is a real pleasure. Their lives are still governed by a feudal-type system. 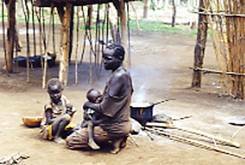 You will discover the Nuer people around Itang. The Nuer are tall and slim. They live in areas that are susceptible to flooding, and have to move their huts at every high-water season. Above all, they are cattle farmers, looking after their herds sets the pace of their daily occupations. Just like in Annuak area, their traditions, their rites, including the young men’s initiation rite, are still very much alive. Going back to Addis Abeba, you will follow the South Road through Bedeke, approaching the Kafa area, its coffee plantations, its vast forests. Then, driving to Jimma, you pass through the Gourague area. N.B. : From Jimma, it is very easy to make a trip to the South.